to tell the truth, i’ve never had a proper, real “russian” beef stroganoff. i’ve had this dish a few times in western style restaurants in japan, or at a friend’s place, or at my husband’s parents’ place in holland. 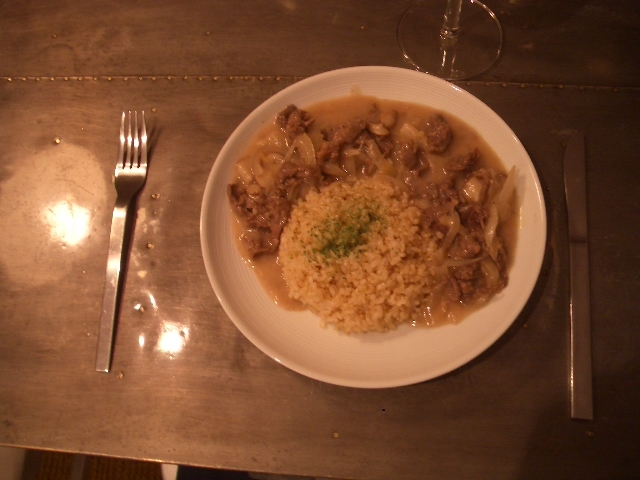 this means i am not sure if this dish precisely replicates the true beef stroganoff from russia, but it tasted good to me, hence the post. in a large frying pan, put the butter and sliced onion. slowly cook the onion in low heat for 10 – 15 minutes. once the onion starts to sweat and becomes nice & soggy, add sliced mushrooms. stir it for another 3 minutes or so, and then add the flour, stir again for another 3 minutes. in a separate pan fry the beef (with tiny pit of butter) until it’s brown, pour the wine, and let it cook for 2 minutes or so. add the beef to the large pan, with all the juice as well, and add vinegar (or lemon juice), and the milk. let it cook for another 5 minutes or so, and put salt & pepper to taste, and if the taste is too sour, sprinkle the brown sugar over it.